Malaysia has sent some 100 firemen to Indonesia to help fight raging fires which have caused choking smog to envelop Kuala Lumpur and other towns. 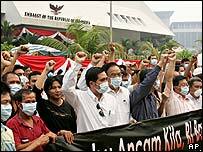 Malaysians are angry that Indonesia has not done more to crack down on the land clearance that is blamed for the fires. A change in wind and heavy rain since Friday has improved the situation somewhat, officials said. The team is due to stay in Indonesia's Sumatra province for two weeks. The team, which includes disaster management experts, will join fewer than 500 Indonesians currently fighting the blazes with buckets, water pumps and garden houses. Australia, which has considerable experience in fighting bush fires, is also sending an emergency assessment team this week. Indonesian Forestry Minister Malem Sambat Kaban said on Monday, after meeting President Susilo Bambang Yudhoyono, that eight Malaysian companies operating in Indonesia were suspected of causing the crisis. "It's obvious. They are not allowed to do any burning, it has to be done with zero burning. They will be punished," he said. Conditions have improved over the weekend, but five northern towns were still experiencing unhealthy air, according to Indonesia's Department of the Environment. However, the department warned that another change in the wind's direction could bring unhealthy air back into Kuala Lumpur.